I love when I can take a shortcut on preparing a meal that doesn’t compromise the integrity of a dish by adding preservatives and additives, rotisserie chicken is one of those things for me. Rotisserie chickens are a great value and are simply roasted chicken, at least the one I buy is. Rotisserie chicken is also a real timesaver and I can always use something that saves me a bit of time so I can do other important things like unloading the dishwasher. 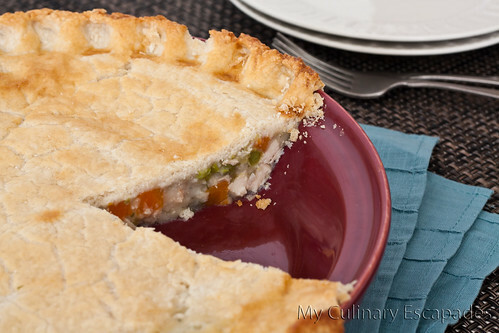 This chicken pot pie can be made easily and is so creamy. Pot pies are great because you get your protein, vegetable and starch all in one spot. So easy and tasty. The most difficult part of the recipe is the pie crust and you could certainly buy store bought if you prefer to. Making pie crust can be tricky business, but oh so worth it. Debone your rotisserie chicken. Cut up and set aside. Heat up the 5 cups of water in a small pan. Add the 2 bouillon cubes so that they dissolve in the water. In a large pot or dutch oven, melt the butter and sauté the onions, garlic and celery over medium heat for 10 minutes or until onions are translucent. Add the flour to the mixture and cook for several minutes, stirring continuously. Add the heated stock to the mixture and stir well with a whisk to incorporate and make sure there aren’t any lumps. Add the pepper, salt and milk. Simmer over low heat a couple of minutes until mixture thickens. Add the cubed chicken, frozen carrots and peas, frozen pearl onions, and parsley. Mix well and cook until the mixture comes back up to a boil. Set mixture aside and allow to cool while you prepare the pie crust. Prepare pie crust by cutting the shortening into the flour and salt mixture. Add water until the dough holds together when pressed. At this point you have two options—you can decide to make your pie with a top and bottom crust or just do a top crust. I like to try and cut my carb intake as often as I can so I opt for the top crust only option but I know many people who love the top and bottom crust. It is your choice. If you are doing a bottom crust roll out your crust and line your pie pan with it. Add your chicken pot pie mixture to the pan making sure to not overfill the pan. Top with a second crust and crimp the edges to seal the pie. If you are doing a single top crust you only need to pour your chicken pot pie filling into the pan and top with a single pie crust. Using your fingers crimp the edges to the side of the pie pan. Beat one egg in a dish. Brush the top of your pie with beaten egg using a pastry brush. Place pie in a preheated 375 degree oven and bake for 20 minutes or until top is golden brown.